RancherMan & I had a wonderful porch addition built to augment our back porch. Even before the porch addition, we’ve always spent our evenings out there enjoying that Texas sunset. And when we have company, we all naturally congregated on the back porch. But now with the addition there’s even more room to spill outside & visit. And I’ve landscaped it up (on the cheap though, y’all) so it really is an oasis! I thought about various canning jars I had around the house and ways to affix the hanger. But I wanted something pretty too, ya know? 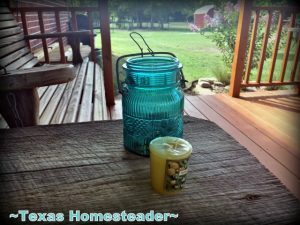 The Perfect Repurposed Jar… For CHEAP! Then one day, it happened. We were attending a garage sale in Amarillo, TX with my favorite aunt when I saw a pretty blue flip-top jar, but the top was missing. Since it was ‘broken’ they only wanted a quarter for it. But this was PERFECT for my little porch lantern since I wouldn’t need the top anyway. I practically danced to the seller as I handed her that quarter! Once we got home I asked RancherMan if he would be able to affix a wire to hang my candle. I needed it to hold the jar steady and upright too, which means the wire shouldn’t be able to slide or shift the weight of the candle. Of course he steps out into his shop and returns just a few minutes later. That’s perfect! 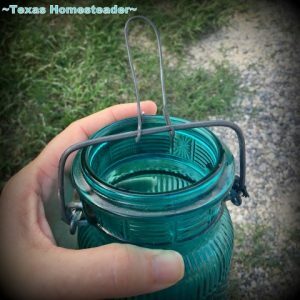 He attached some heavy fencing wire to the leftover flop-top metal hardware from the jar’s broken lid. That little metal loop can be laid down if I want to set the candle jar on the table next to our porch swing. Or the wire can be stood up to hang it on the decorative hook I have mounted at our porch’s ceiling. I used to burn candles all the time, but I don’t really burn many anymore. I had a large box of new and used scented candles that I’d offered to friends & family. They took several off my hands but I still had many in this box. I figured I’d just melt them down for my Fireplace Starters so at least they’d get used. But now I have a better and prettier use for one of those candles! So out to the driveway I go to scoop up some of the gravel for the bottom of the jar. Then I insert a small votive candle atop the gravel. Yes – I like it!! I think it’s absolutely perfect! Just enough mood lighting to accompany us while enjoying the back porch, but not bright enough to attract every flying insect in the county. Repurposing An Empty Parmesan Cheese Container – BRILLIANT! 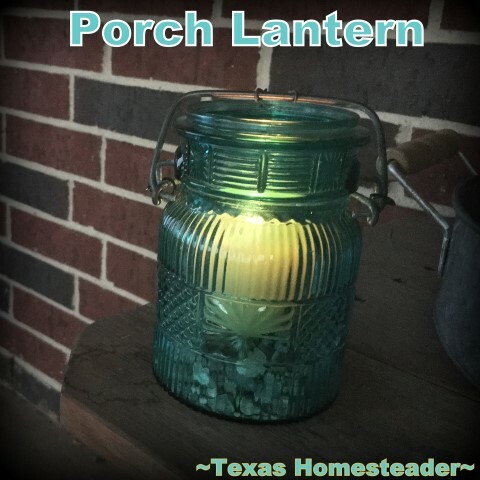 This entry was posted in Blog Posts and tagged Frugality, Make-It-Yourself on October 18, 2018 by Texas Homesteader. I love that jar. I, too, would have grabbed it for .25$. In my early years of canning on my own our local radio station had a service called “best buys” and people listed things they wanted to get rid of. Someone had clear, pint, bail top (that’s what we call/called them in Oregon) jars to sell. I think I bought all she had at either 10 or 25 cents a dozen but maybe it was a piece. 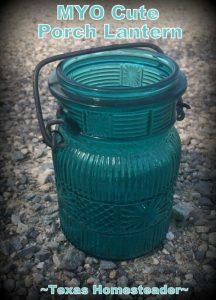 Long long ago, but it was easy to get the jar rubbers in those days. I did not use them for tuna or other meat, just fruit as I recall. I don’t really do much canning any more. A few years ago my son had several tuna from a trip out on someone’s boat, he brought a crab cooker (don’t can this way unless you are prepared to watch the dial like a hawk! They get very hot very fast). We filled jars, sat out in the driveway in front of the house and watched those dials (like hawks) so all the smell was outside. Other than that and a couple of years ago some tomatoes (on the stove in the house) I use the food dryer or the freezer (s). I’ve given away many of the jars, but still have some blue ones and a few others left to use for storage on the counter and such. This is so cute! I love the softer light idea. We’re in the humid area of the northeast so bugs are definitely an evening issue.